Wondering what can one expect from a mere $60 tablet? The hardware sheet speaks of a 366MHz Connexant CPU, 256MB of RAM, USB port and 2GB of storage which can be expanded up to 32GB via a microSD card. On the connectivity front, with Wi-Fi and GPRS in store, it enables on the go email, web surfing and so on. Students can also look forward to support for HD quality video and audio software library that manages the music collection. The supported audio file formats are inclusive of MP3, AAC, AC3, WAV, WMA alongside MPEG2, MPEG4, AVI, FLV video formats. Reportedly, it was earlier to be a $35 laptop which then changed its course to the trending tablet era. With keen interest taken for this project by HRD minister Sibal along with IIT Rajasthan technologists, the motive is to bring technological advancements in the educational sector. 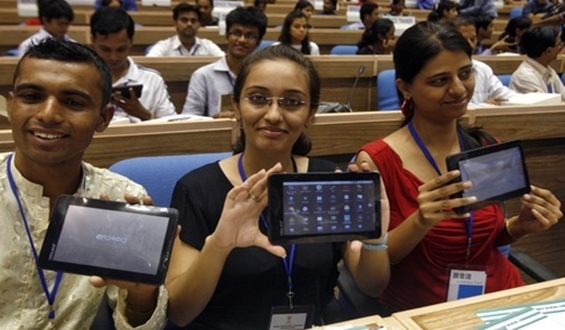 The government plans to buy 10 million tablets and source them to post-secondary students across the nation for a price of Rs. 1,750. The commercial version dubbed Ubislate will be made available by Datawind next month for a price of Rs. 2,999. The difference between the Aakash and UbiSlate is the cellular modem in the latter for anytime web access and mobile phone functionality. may beit will change ours life. Yah it seems it ll cause it is having low cost and this suits to all. bro it vl f which cmpny?? ?nd frm where we can get it...? ?